Datsun has the Go to match the show! Every time I wait for the cab, my neighbours or friends excitingly ask me the same question – “Are you going to drive a Ferrari?” I haven’t yet managed a ‘YES’ in reply to that. But surprisingly, this time, a grandma came and asked me to help her son in buying a new car below 4 lakhs. I replied that I will meet her once I am back from my drive. 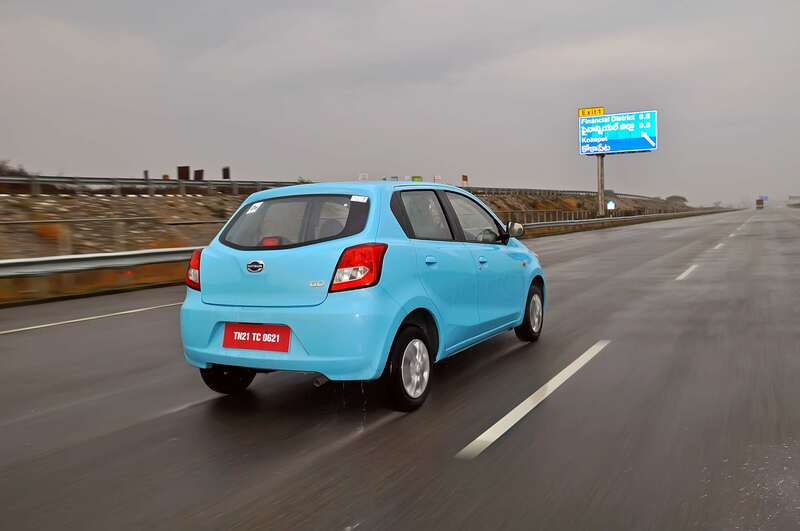 We’d finally reached the city of pearls – Hyderabad – to test the brand new Datsun Go – India’s all-new budget car! We say this car has got all the real stuff to take away the budget car of the year award of 2014. 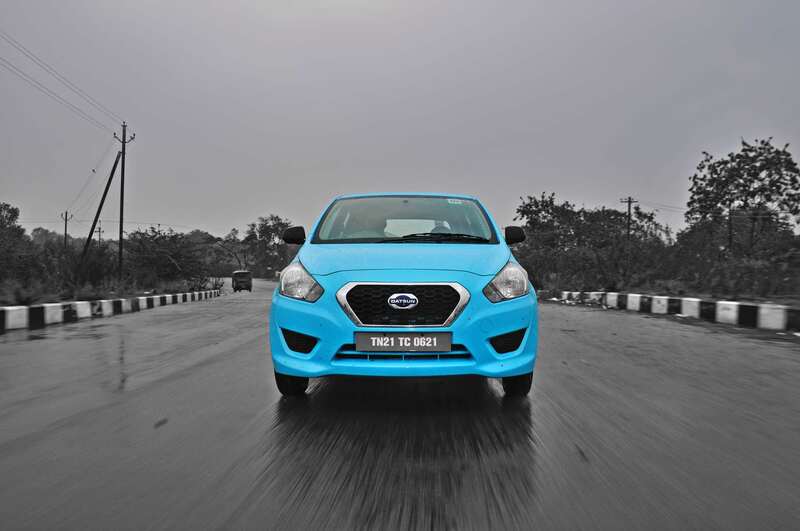 The Datsun Go is a perfect package of robust looks and comfort. 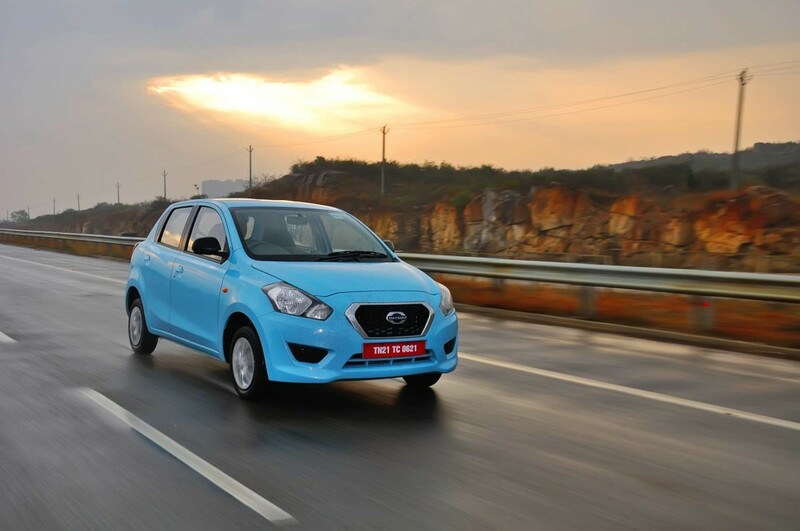 From the front, the Go is all about distinctive looks with the D-Cut grille and the big headlamps exude a strong design language of the Datsun brand. At the rear, again, they’ve made it simple yet stylish. Overall, the Go looks imposing compared to the usual hatches which we get to see on-road every day. 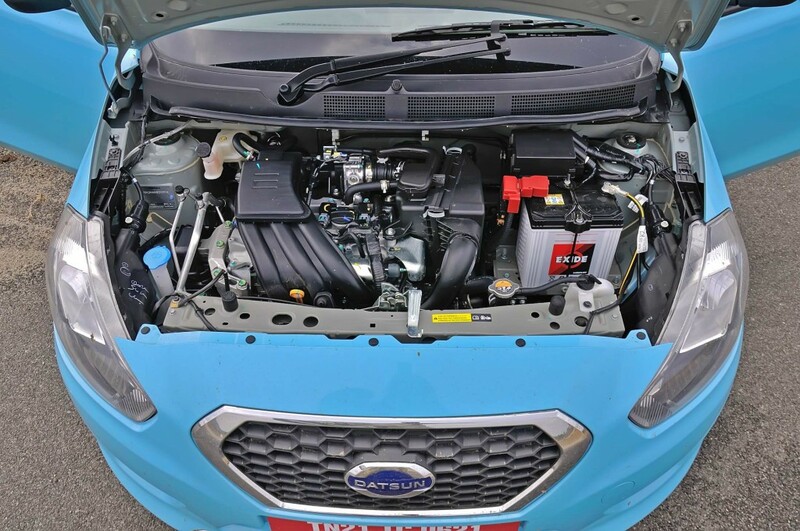 Under the hood is a 1.2-litre three-cylinder petrol motor that’s similar to the one in the Nissan Micra Active. It makes slightly less power than the Micra Active, but with its light-weight frame, the Go is a good performer. The engine is happy to rev, and whenever you push the throttle, the rpm steadily increases without much fuss. The Go will easily hit triple digit speeds in just 15 seconds, and cruising at higher speeds is not a big deal either. The car is stable and it will not distract you with vibrations at higher speeds. The Go impresses you with the interiors as well. The first thing you will notice inside is the null gap between the front seats. The gear lever and handbrake are placed in the centre console – which gives way to the connected front seats. Nissan says the intention is not to carry a third passenger, but in India, we sure know what those connected seats will be used for. The speedo dials are simple and there is no radio or CD player. But you are offered with aux connectivity, with a phone/iPod holder next to it and a USB charging point. In the rear, the space is not bad either and the one thing you will complain about is that driver doesn’t get access to all the controls. The front door gets power windows. However, every other door gets its individual control and the driver has no control over the other windows what-so-ever. So it is a bit old-school that you need to lean over and close the windows. 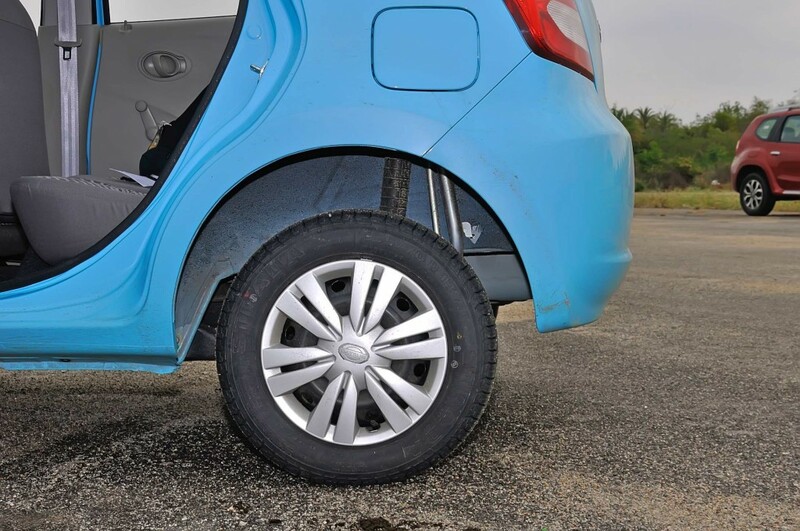 Similar to the Hyundai i10, the Go is tuned for better fuel efficiency. The engine produces 68PS of power and 104 Nm of torque and claims a fuel economy of 20.63 kmpl. 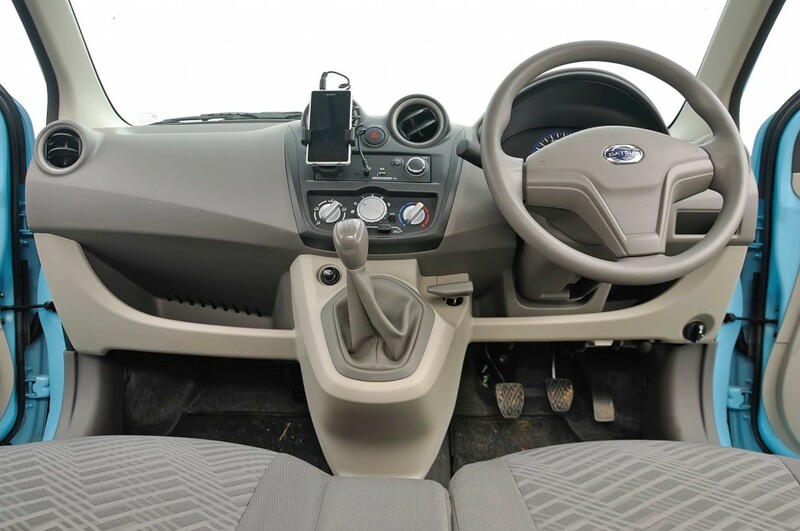 The Go features a speed sensitive electronic power steering which is very precise. Compared to the i10, the Go is an impressive package if you are okay with the bare-basic interiors. There is only one wiper at the front and no wiper in the rear end. The outside rear-view mirrors are not body-coloured and need manual adjustment (no levers are available). The Go runs disc brakes up front; it doesn’t get anti-lock brakes and doesn’t get airbags on any of its variants. Overall, the Go is a good entry-level hatch with a few features that should help it compete with its rivals, like the Celerio and the all-new Chevy Beat. Barring its shortcomings, the Go offers every bit of comfort – from the driver to the passengers at the rear. Expected to be priced below Rs.4 lakhs, the Go is set to be a game changer in the entry-level hatchback market.